The Lockheed Vega first appeared in 1927, and the first example was lost in the Dole Race to Hawaii. It was a wooden, high wing monoplane, featuring a higher standard of aerodynamics than had been seen up to that time. 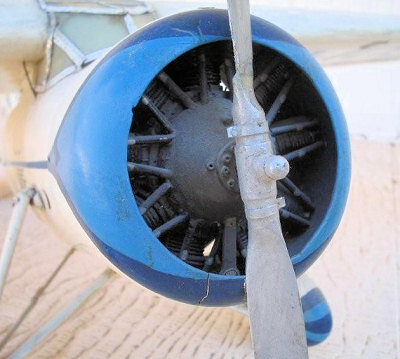 Original models had a Wright J5 Whirlwind of 220 hp., but later models had engines as large as the Pratt and Whitney Wasp B9, which developed 450 hp. Most served with various airlines during the late twenties and early thirties, but although they were very fast, their single engines and maximum capacity of five to six passengers wasn’t enough to compete with the larger airplanes that were then coming into use, and by the early thirties, they had been replaced in airline service with multi-engine aircraft such as the Boeing 247, and later the Douglas DC-2. I’m not sure exactly when this model was built, but I believe it dates back to the middle thirties. 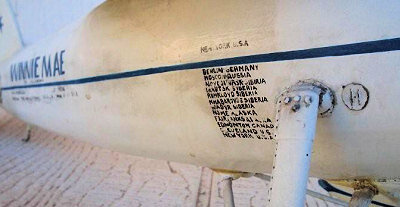 Since the sides of the plane have a record of one of Wiley Post’s round-the-world flights, and these flights occurred in 1930 and 1933, the model probably dates from about 1934 or 1935. It was one of three made for my father, who at the time operated Baker-Eberle Flying Service at the Detroit City Airport. 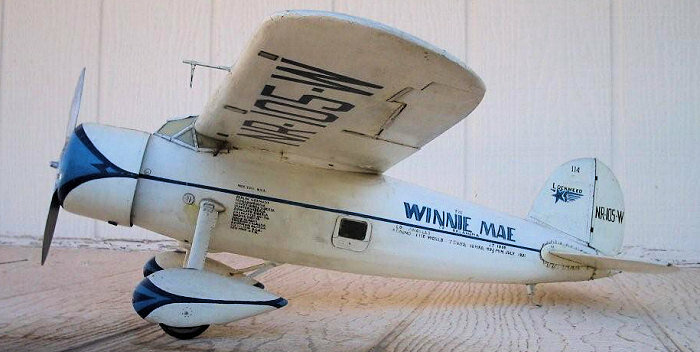 I recall my Dad stating that the three models were given to him in exchange for teaching the builder to fly. I never heard the builder’s name, but Dad said that he was a pattern maker for Chrysler Corporation. 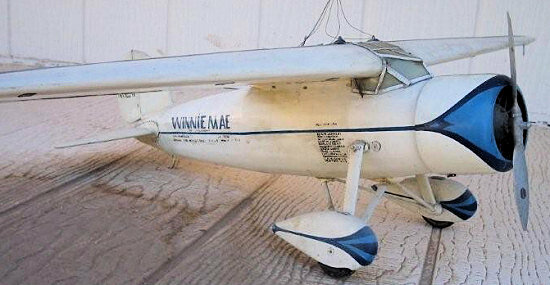 Baker-Eberle were dealers for Aeronca airplanes, and at the time would have been operating the Aeronca C-3, more commonly known as the “bathtub” because it was so low to the ground. Since I was not born until 1938, I always remember the airplane models hanging from the ceiling, tantalizingly out of reach for a small boy who even then, was in love with airplanes. Somehow, the planes have survived, with the Lockheed being the most durable, and having had the least repair work. When I got the models many years ago, a propeller blade was missing, and I replaced that with a piece of balsa wood, but not a very good repai r job. The other two models, by the way, were an early Aeronca C-3, currently in the process of being restored, and a Curtiss Jenny, which my son has restored and has hanging in his den. This model is made entirely of balsa wood, and I believe it was scratchbuilt . All three models are built to the same scale, and the wingspan of the Lockheed is approximately 30 inches. As far as I can tell, it has a full interior, as the cockpit can be dimly seen through the 75 year old clear plastic used for windows. It even has the wing inspection windows. Everything is hand painted, and very well done. This guy was a real artist, and as a modeler, I really appreciate his efforts, given the materials he had to work with. I know that there was a “hobby industry” during the thirties, and that a lot of people build flying scale models, and these may have been kits, but I’m really not sure. The ability to make compound curves with thin balsa sheet has to have been one of the lost skills of modeling, and just looking at the model and the time and effort put into it makes me feel that my Dad got the best of the bargain. I have the airplane hanging in my den, certainly the largest of my collection of models, the others of which are all 1/72 scale. I still spend a lot of time just looking at it and admiring it. It will stay in the family for generations. It is over seventy five years old.